Perhaps the biggest difference between Wicca and other religions is the belief that individuals can do more than simply pray to a supreme, all-powerful deity and hope that things will work out to their benefit. Wiccans understand that individuals can actually co-create with the forces of nature by linking their own personal energy with the divine through ritual and magic. But what is “the divine” when it comes to Wicca? Who are the Goddess and the God, and where did they come from? Why do they have different names in different Wiccan traditions, and how do you begin to work with them in your personal practice? Magical Deities, by best-selling author Lisa Chamberlain, answers these questions and more. Going beyond the usual brief introduction to the God and Goddess found in many beginner guides to Wicca, Lisa covers the origins of the Wiccan deities, as well as their varying manifestations among different Wiccan traditions. What’s more, she explains the difference between traditional duotheism and more eclectic polytheistic practices, both of which are found among the diversity of forms within this dynamic religion. You’ll find advice for learning to forge your own spiritual connection with the divine masculine and feminine, and introductions to sixteen ancient deities who often function as “aspects” of the God and Goddess within Wiccan practices. Finally, you’ll find ideas for honoring and working with these deities in your magical practice—and make no mistake, having the assistance of the gods and goddesses of the Universe is an enormous boon in the magic department! The paths to connection with the God and Goddess, or to any of the deities “borrowed” from other cultures are as multiple and varied as the people who worship them. Ultimately, your intuition and your heart are your best guides along your journey. But the more you know about the gods and goddesses you seek to work with, the more authentic and astounding your connection with them has the potential to be. 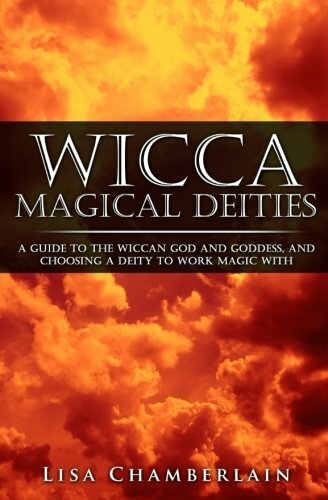 As you make your way deeper into the realm of Wicca, Magical Deities will be a trusted travel guide! Scroll to the top of the page, hit the buy button, and you’ll receive an exclusive free gift!